The local summer squash has been looking very good lately, and my daughter actually asked for some summer squash (she usually avoids zucchini). Then I remembered this casserole that my mother in law made us when we were in Michigan visiting them. The live on a dairy farm and My FIL always has a large garden going. 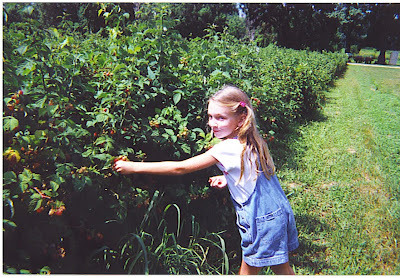 Maranda has been able to pick fresh raspberries (her favorite) ever since she could remember. 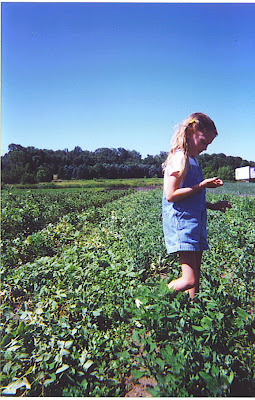 She was also able to see how the squash (both summer and zucchini) grew, she got to pick apples, grapes, strawberries, and carrots, green beans, and many more depending on what time of year we visit. I even went out with her to dig up some potatoes, she wasn't into getting her hands dirty for that! Maybe some corn...she is out standing in a corn field...don't get lost! She was real little here. Have you ever had sugar snap peas fresh from the garden? Nothing better! 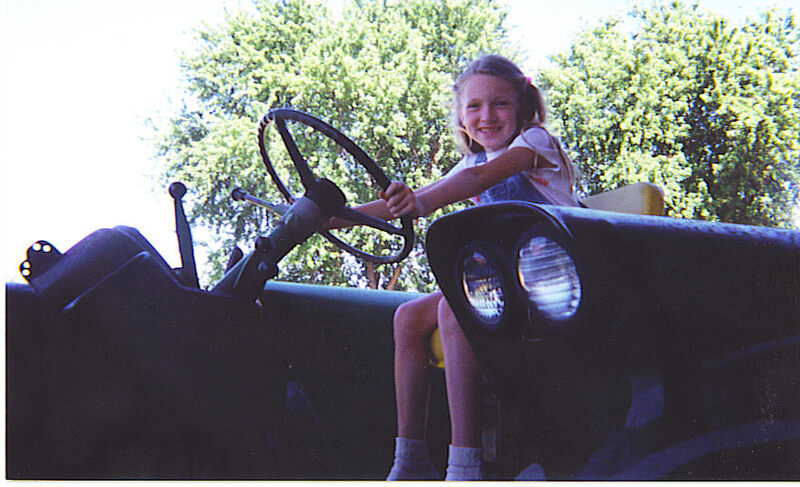 Her dad wanted a picture of her on the tractor, she couldn't reach the pedals yet to plow the field! Back to the recipe! This is what I had to go by(note the cow, she has a lot of cow things). It seems the recipe is from Wade's Aunt Myla. You know how some of these old or I should say "classic" recipes are. I will type just what it says, and then tell you what I did! Place: squash mixture on bottom of casserole dish, spread meat over top. Bake at 325 degrees to brown topping. I used two zucchini and 2 summer squash and sliced them. I didn't boil them first because my husband doesn't like the squash mushy. I figured it would cook just right with out the boil. Since the carrots are shredded they will cook in a short time too. I used ground chicken instead of beef, and brown the onions (I like to use shallots) with the meat. I just used a vegetable peeler to shred the carrots. I did use Campbell cream of chicken soup, the low sodium one. I used Stove Stop whole wheat stuffing and seasoning. I also added some of my Bonne Herbes blend on the squash, and I used butter instead of oleo, but used less than 1/2 cup. Baked for about 25-30 minutes. Until the top is browned and the squash is tender. This is my kind of comfort food. Healthy, but with a little butter and stuffing thrown in! Everyone was happy and ate it! I was lucky to have some leftovers for lunch! Happy Friday! See you on Sunday for Tailgating time! Maybe I'll bring this along! What I would not give for a big dish of that squash. One of my favorite dishes. What makes it even better is that precious little girls helping hands. A wonderful casserole and post! Yummylicious. Lyndz, thanks for sharing those wonderful pictures. Maranda looks so cute! I enjoy this kind of places. So much fun enjoying the fresh fruits while picking. haha... will came out empty handed and with a full belly. haha.... And your squash casserole looks very yummy. Thanks for sharing. Hope you're enjoying your weekend. Great casserole! It sounds delicious! Sweet little girls too! what a delicious casserole, I do love squash!! 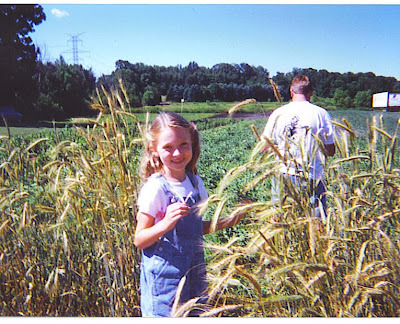 and thank you so much for sharing those lovely pictures....she is adorable.....sigh.....they grow up too fast! LV - thank you! I wish I saved you some! Kristy - It was so funny when she'd come in the house and we'd ask...where are the raspberries? We can't get raspberries fresh from the farm here in Florida! Chef Dennis - I know what would be perfect to top this...squash blossoms! :D Thank you... they sure do grow up fast...these seem like they were taken yesterday! Susan - thanks, I'm glad you enjoyed it! What a great post! Love that you shared photos; she is adorable. What a garden and that casserole look so good. awww, love the old recipe, thanks for sharing! Rita - thanks, it was fun looking back and post the old photos. anniebakes - thank you, it's nice to bring back some of the old or should I say classic recipes. wonderful post! 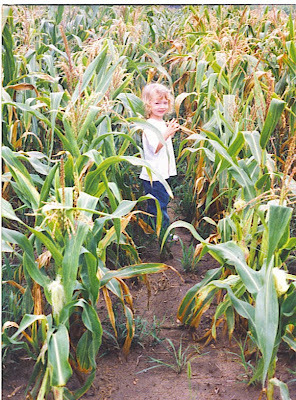 and such adorable pics too..
Looks like a great way to get some veggies! wonderful post! i think the last batches of summer squashes are on market right now and this cassarole is now tempting me to pick up some.. This dish looks very healthy, I would love to hv some for lunch too. Pam - you're right it is a great way to get your veggies. Kitchen Butterfly -thanks, she is lucky to get that chance to see it on a farm. 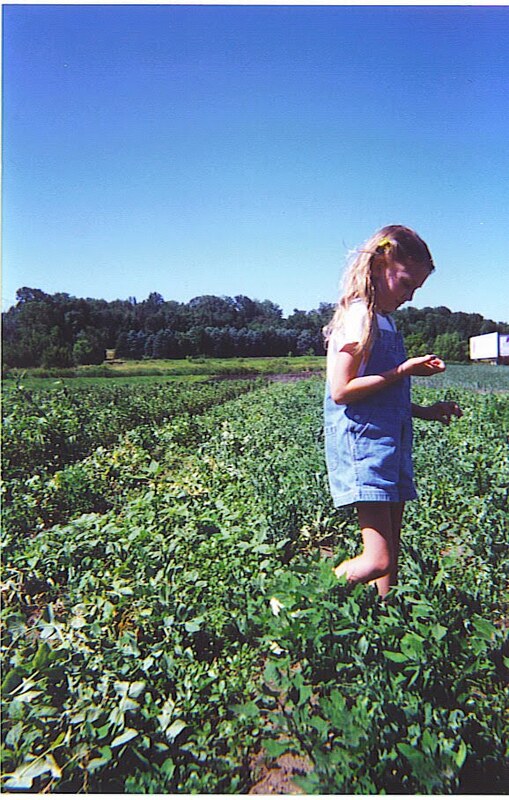 Some kids just don't know where their food comes from. PJ - Thank you, I always enjoy zucchini and summer squash year round. I like to throw it in salads too. Cheerful - Thanks, I'm glad you enjoyed it. Jeannie - I liked it with the veggies slightly al dente, it worked well heated up the next day. Lyndsey, this looks fantastic! I need a side dish for Thanksgiving that's not the same old thing - this is it! Thanks. This looks crispy and delicious, and, a great recipe for using more of my lovely zucchini! I love all of the flavors that you've used--I love when comfort food is nourishing and healthy!